Flash and the City is next week in New York. If you are registered and taking the course to learn Flex/AIR mobile development, you will need to do some preparation in advance of walking into the room. This blog post outlines the steps necessary to be ready on Thursday, June 9. If you have any trouble with the setup, please send an email to me at dnickull at adobe-dot-com. I also plan to be in the lab room 20 minutes before the session to answer any questions or help out. See you there! This is going to be the best workshop I have ever had the pleasure of teaching! An expanded version of this course will be taught at this year's Adobe MAX in Los Angeles. 1. Bring your own laptop. Operating System: Windows or Mac OS X. 2. Bring a power cord. 4. A cable to tether it to your laptop. It is not required that you bring your Android Device but it is highly recommended. If you have more than one laptop, please bring one with a touch pad that supports transformation gestures (most newer Macs support this) and a camera and microphone. Flash Builder may be installed as a trial. This will also install the AIR runtime and SDK. This is a quick video that shows the code to control zoom gestures when developing mobile applications with Flash Builder 4.5. The source code is available if anyone wants it. Just ping me at dnickull at adobe dot com. 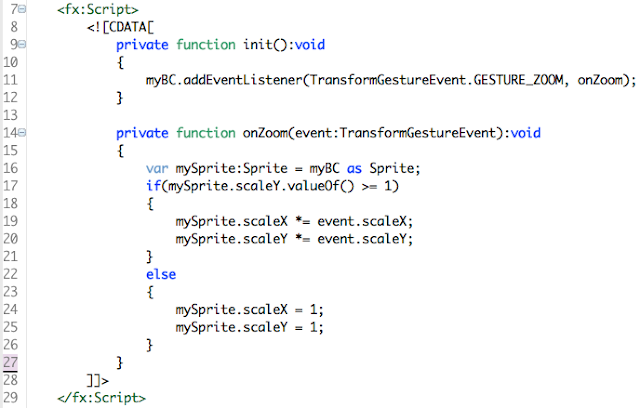 Line 9: The init() function is called on the viewActivate event for this example as it is a mobile application based on views. You could queue it from other events. Line 11: the Variable myBC is a Spark BorderContainer. Line 16: The BorderContainer is cast into a sprite and the event passed to the onZoom function is used to scale the sprite on the X and Y planes on lines 19 and 20. If you want to keep the user from shrinking the sprite below a specific size, the test is done on line 17 to detect the scale. You only need to test either X or Y and the proportions are constrained. The best practice for most cases will be to put some sort of minimal scale on such items as it will be possible the user scales it too small and can no longer use a two finger zoom gesture. To learn more about this topic, make sure to attend Adobe MAX 2011 in Los Angeles and register for the Hands on Mobile AIR camp I will be leading. Registration is open now and even though we had two mega-labs last year, they both sold out very early. I am also teaching a similar course next week at Flash and the City in New York City June 9 from 9:00 AM to 2:00 PMN local time. There are some spaces still available. Mobile developers are in high demand. Increase your skills!